The Community Foundation recently funded two programs in the region that are harnessing the power of art and music to help seniors affected by Alzheimer’s disease and dementia. With an aging population comes the issue of how to help people navigate life with these conditions. 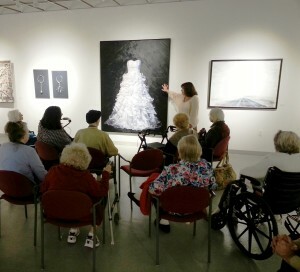 Silver Maples of Chelsea and the Birmingham Bloomfield Art Center are helping address some of the challenges that are most often cited by caregivers, including the boredom and isolation that result from the loss of many activities and relationships that once gave life pleasure and purpose. Music and Memory supports the emotional well-being of dementia patients through music. The program provides participants with mini iPods loaded with music that is personalized to their age, culture and important personal associations. The music is designed to activate buried memories and to inspire positive feelings and connections. Music and Memory achieved international acclaim when a movie about program founder Dan Cohen’s innovative techniques won the 2014 Sundance Film Festival Audience Award and became an internet sensation. The expressions of joy and recognition on the faces of the dementia patients as they listen to music are extraordinary. Watch a trailer for the film at AliveInside.us. Some residents of Chelsea saw the film and contacted the Silver Maples of Chelsea senior living community about the program. Thanks to a $7,111 grant from our affiliate, The Chelsea Community Foundation, Music and Memory has launched a community-wide endeavor in partnership with Ascent Hearing, the Chelsea Senior Center and the Chelsea Retirement Community. Staff of the partner organizations will be trained and certified in the method, and will train as many community volunteers as possible to work with the seniors. 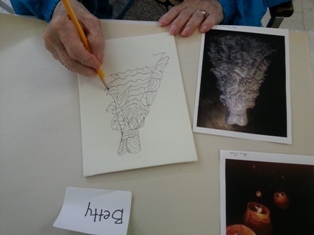 Another effort, Meet Me @ the Birmingham Bloomfield Art Center, uses the visual arts to engage those with Alzheimer’s disease and dementia and their caregivers. Participants are invited to enjoy the art on view in the gallery and then talk about it, with no right or wrong answers and no judgment. They then move to the art studio for one to two hours of art-making. Because the Birmingham Bloomfield Art Center (BBAC) art gallery features a new exhibit every four to six weeks, even regular visitors get fresh inspiration. “It’s the perfect blend of relaxation and creative reward,” says BBAC President and CEO Annie VanGelderen. The BBAC is safe yet stimulating — an ideal setting for patients and caregivers who may find the bustle of city streets and shopping malls a source of anxiety. Meet Me @ the BBAC sessions are open to visitors and caregivers who register in advance, and account for about 400-500 visits per year. The program is made possible by a $60,000 grant over two years from the Community Foundation. The grant is also helping to forge partnerships with regional senior homes and care centers, including Botsford and Oakwood hospitals, which bring groups of residents and caregivers from throughout the region to the program. From a report by the Community Foundation for Southeast Michigan. Make a tax-deductible contribution to the BBAC.